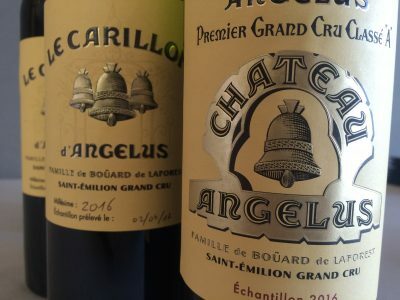 Hubert de Boüard is understandably delighted by the quality of the wine at Château Angélus in 2016. It is remarkable St Emilion that rivals the prodigious 2015. With price up 16% [33% in Sterling terms] on the ’15 the de Boüards clearly think they have something even better on their hands. Yet it is the quality of the other wines here that dazzled particularly this year. Carillon d’Angélus is no slouch. It is nicely layered with wonderfully refined tannins. 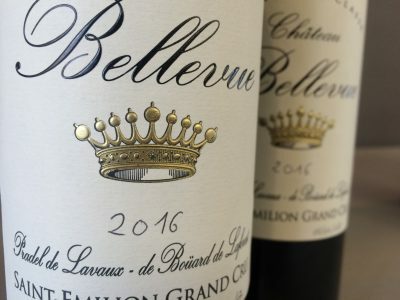 Château Bellevue showed brilliantly. It has lots of beautiful perfumed fruit and a great texture. Château Daugay is enticing and open. It is all satin and black cherry tones currently. Château Roc de Boisseaux comes fully loaded with black fruits and is lots of fun. 2016 looks impressive across the range here. There is no doubt that the magnificent 2016 summer and harvest conditions really suited the Cabernet Franc in particular at Angélus. Three months of drought was ameliorated by useful day-night temperature fluctuations [2:1] which allowed the grapes to retain freshness and perfume despite the sunny, dry conditions. A generally beautiful September and October, with two important bouts of rain, enabled unhurried, plot by plot harvesting. Picking began on October 4 and continued until October 21. The resulting wine is magnificent. It has fabulous depth and body, remarkable purity and enticing perfume. Released at 294 euros a bottle I think even James Bond will be pinched to afford it now [though perhaps not Daniel Craig himself], beauty though it is. Château Bellevue, Château Daugay and Château Roc de Boisseaux were as good if not better than they have ever been before. All were beautifully flattering to taste back in April. I was also impressed with Clos de Boüard, a 30ha property in Montaigne St Emilion. It’s a big number that needs to settle down during elévage, but looks pretty promising nonetheless. The following wines were all tasted at Angélus on 2nd April, 2016.